“Imagine what it would be like if you suddenly lost one or two of your front teeth. Smiling, talking, eating—everything would suddenly be affected. Knowing how to prevent injuries to your mouth and face is especially important if you participate in organized sports or other recreational activities. 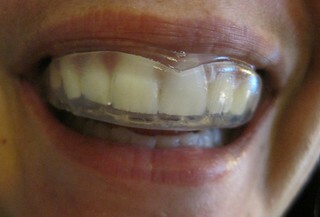 Boil and bite: These mouth protectors can be bought at many sporting goods stores and drugstores and may offer a better fit than stock mouth protectors. They are first softened in water (boiled), then inserted and allowed to adapt to the shape of your mouth. Always follow the manufacturers instructions. CusMbite MVP is a boil and bite mouthguard that has earned the ADA Seal of Acceptance.